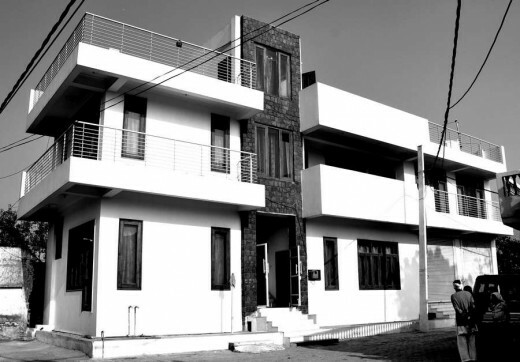 Design Brief: The brief for this project was to design a house for Mr Ved Prakash and his small family of two. Mr. Ved Prakash wanted to build his house keeping the ancient Hindu tradition, philosophy and “Vastu Shastra” (ancient science of Indian architecture) as basic principal and reflecting that in his house. The site being odd in geometry didn’t help with the design. The site was a narrow corner plot facing south-west a difficult orientation in hot climate. Also the opening was possible only on these two sides as neighboring houses were constructed without any setbacks. The requirement was to accommodate a multipurpose hall at ground floor which could be used for commercial purpose like shops etc at latter stage. 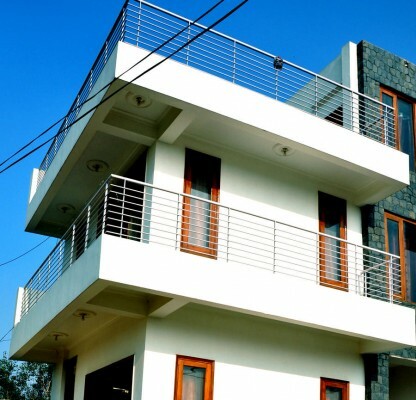 The house is on two levels with three bedrooms and a spacious terrace. The design follows a simple straight line with minimalist approach and a stone clad front wall as architectural feature. 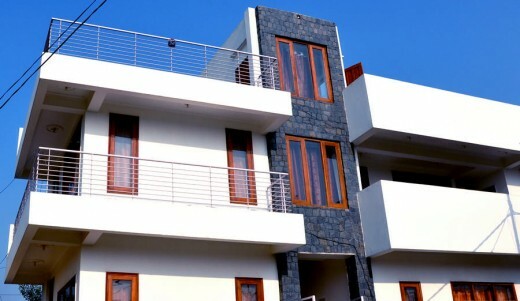 The minimalist straight line design with simple façade of white color and limited stone cladding was initially looked with suspicion in the conservative village where houses with more color, “false” pitched roof, and building more than required is a way to show affluence and wealth. However over the time period the house with required space, high ceiling, central courtyard, protection from sun with planned orientation and well designed space won many appreciations and has set a new trend of minimalist design in the village. Building Material: The construction materials are vernacular i.e local available material. Its RCC (Reinforced cement concrete) along with ash-brick considered to be eco-friendly because of the material used. A local dark stone is used by the client outside by his own choice. However the light coloured – Indian marble is used inside. The house is painted in White colour.